Special birthday outfits for toddler boy birthdays can be dressy or casual. What will your little boy wear to his next birthday celebration? As you search through birthday outfits for toddler boy celebrations, consider the following points. 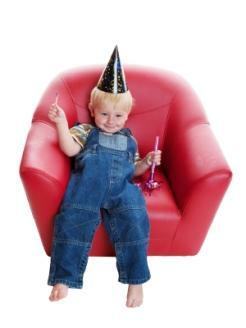 Comfort-While your toddler will probably love his birthday party, too much fun can wear a little guy out. Choose a birthday outfit that provides the comfort your little one deserves. Clothing should be roomy and not pinch little arms and tender necks. Too much clothing can make a busy boy hot and sweaty, so don't overdo it with the layers unless you plan on celebrating outside in cooler months. Design-Sure, dressing your little boy in a three-piece suit will bring lots of chuckles and make great photo ops, but how happy will he be as he runs, jumps, and climbs all over the place? A dress suit is perfect for church and special formal occasions, but it just shouldn't be an option for a small child's birthday party. Look for clothing that will "move" with your child. Materials that are too stiff could end up rubbing tender skin. Shirt and shorts sets or shirt and pants sets are great choices. If you choose little boy rompers for your child, be sure there is plenty of room in the stride for unrestricted movement. Materials-While that woolen sweater set may be adorable, remember it will also have to be dry-cleaned. Look for birthday outfits for a toddler boy that are made of washable materials, like cotton, flannels, or polyester blends. By the time he eats cake and ice cream, guzzles punch, and plays with his friends, his clothing will have garnered a variety of stains. Washable materials will be easy to treat and clean immediately after the party is over. What kind of birthday outfit should you buy for your toddler boy? Clothing theme-Does your child love boats, cars, spaceships, sports, or animals? If so, consider purchasing an outfit that actually matches the party theme. If his party decorations include Disney characters, then you might want to choose an outfit that features those same characters. Visit the Disney store for more options. Style-Do you want to dress your little one in a simple T-shirt and shorts or pants set? If so, you can find outfits like these virtually anywhere that sells kids clothing. Target or The Children's Place both have a great selection of kids' clothing, as does Kohl's, JCPenney, and Belks. Accessories-What accessories can you purchase to dress up your little boy's birthday outfit? How about a jaunty baseball cap that matches the rest of his outfit? A sailor suit dictates the need for a sailor cap as well. Colorful tennis shoes or fun sandals make great party choices, too. For cold weather, consider a sweater vest/shirt combination, but again remember not to overdo the layers. You don't want your little guy getting too hot during his big day. Custom outfits-How about purchasing a custom-made birthday outfit for you little one? Visit Kelly's Kids website for a wonderful selection of monogrammed, appliquéd, and embroidered children's wear. Choose an outfit that features your child's name. Additional details could include the words "birthday boy" or simply feature balloons and a party cake, designating this indeed a special birthday outfit that will become a treasured keepsake. However you decide to dress your little boy for his big day, take plenty of pictures and enjoy this very special time. Before you know it, he'll be much too big for you to dress!